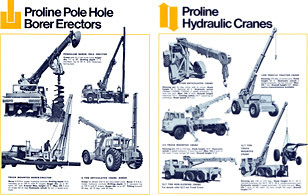 Premier Proline Pty Ltd is an Australian company with over 30 years experience supplying boring and lifting equipment for large and small scale applications. Premier Proline is a wholly owned division of Hydroil Pty Ltd, a leading Australian hydraulic cylinder manufacturer. Premier Proline's reputation for quality and a high level of customer service has resulted in a significant increase in demand for our products and services. In 2007 Premier Proline moved to a new 5500sqm (undercover) facility in Woodville, South Australia, employing over 40 full time staff to meet the demands of our customers. Premier Proline is committed to the continuous development of our products and will continue to invest in tomorrow by delivering only the highest quality equipment to the industry of today. Every Proline machine is backed by the experience and design expertise gained in over 30 years of research and development. Units are in continual development and often manufactured to customer's specifications. Premier Proline keeps comprehensive records and carries a large range of spare parts for all machines supplied. This combined with our experience and investment in trained personnel, eliminates costly delays in the supply of both information and parts to customers.